Alexander Fiske-Harrison – right – is a British author, journalist, conservationist, bull-runner and former amateur bull-fighter. He grew up in England before moving to Spain in his 30s. He studied large mammal zoology and animal behaviour at the University of Oxford and foundations of biology and animal consciousness as a postgraduate at the University of London. Researching for a book, he trained – pictured below – as a bullfighter in Andalusia with matadors including Juan José Padilla, Cayetano Rivera Ordóñez and Eduardo Dávila Miura. The book Into The Arena: The World Of The Spanish Bullfight was shortlisted for the William Hill Sports Book Of The Year Award 2011. His story of 1950s Paris and Pamplona, ‘Les Invincibles’, was shortlisted for The Hemingway Prize 2016 in France. In Spain, he has been invited as speaker at the Foundation of Taurine Studies, at the University of Seville and for the Ambassador of Spain to the United Kingdom. He has written and spoken on the world of the bulls for national and international media including The Times, The New York Times, Newsweek, GQ magazine, the BBC, CNN, and the Discovery Channel. He first ran with the bulls in Pamplona in 2009 and, with the exception of 2010 – when he was bullfighting in Andalusia – he has run every year since in the encierros, ‘bull-runs’, of San Fermín, as well as those of other towns across Spain including San Sebastián de los Reyes (Madrid), Cuéllar (Castile and León), Tafalla and Falces (Navarre). This is what the bull-runners say to one another: they mutter it in restaurants and whisper it in bars, some still write it in letters and others type it in emails and post about it on runners’ groups on social media. This taurine chatter happens all year long, but those icy notes of anxiety… of trepidation… of dread, begin to enter our voices as the Spring sun rises. Deep down in our unconscious minds the Vernal Equinox makes dark things stir, memories, fears… the ghosts of bulls we’ve run with, and almost died with. 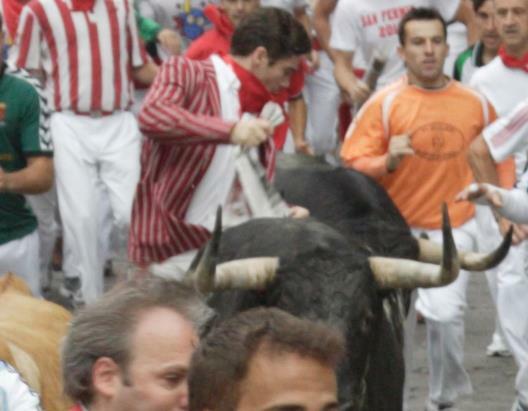 Every day that I have run in Pamplona, the greatest and most famous encierro – ‘bull-run’ – of them all, alongside my fears for myself have been my fears for others. Hence the need for this book. At each of those forty-odd San Fermín encierros (as of 2016) I have been stunned by the belief so many newcomers seem to have that these animals are somehow not dangerous, tame even, because otherwise how would this event be allowed to happen? I mean who would let unwitting tourists loose in a street with half-ton horned animals that have never seen a man on the ground before? The answer is, to paraphrase The Go-Between, Spain is a foreign country, they do things differently there. 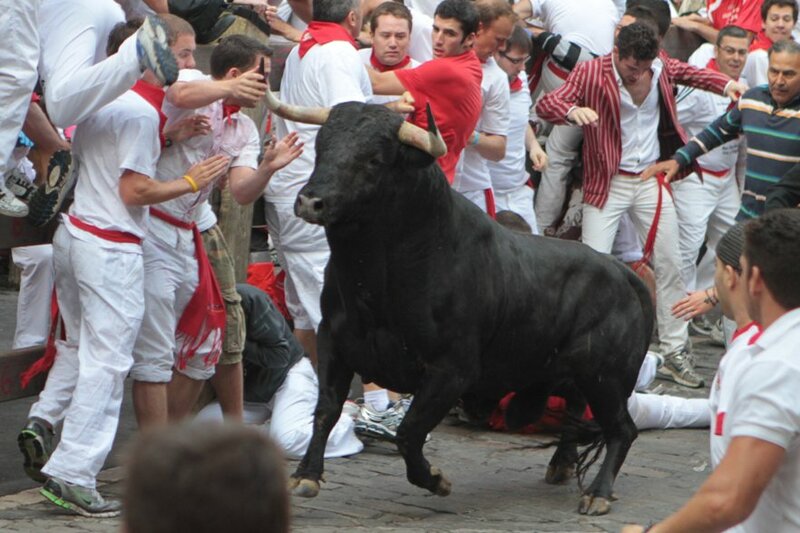 In my 4th ever encierro – left – in Pamplona in 2011, I found myself wedged against the fence by a panicked press of human bodies unable to move as a four-year-old, 585kg (1,290lbs/92 stone) Spanish fighting bull bore down on me. That day the bull, Empleado, from the notoriously dangerous ranch of Cebado Gago, decided to take the man next to me instead. He ended up in hospital while I ended up in Bar Txoko, and it was the bull who made the decision on who ended up where. 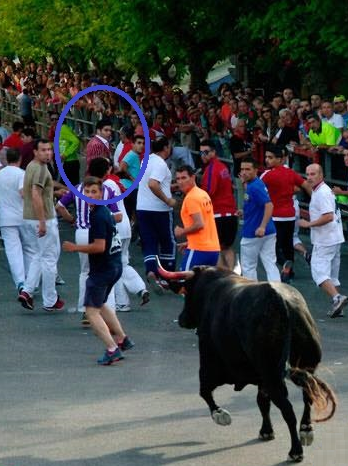 That day made me as a bull-runner, and I have not run the same since. 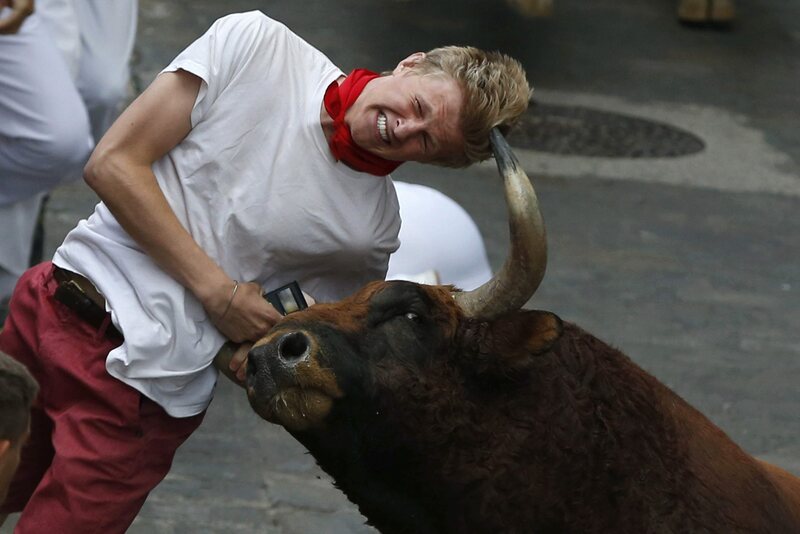 Which is why in 2015 in Cuéllar, the town in Old Castile which hosts the most ancient encierro in the world – right – I kept a healthy distance from a bull whose left horn was coated with the blood of a man he had just killed. If you watch the video of that killing it looks like a glancing blow: the bull runs passed him, and nods its head as though it were bowing in respect, and yet in a movement to fast for the human eye to perceive, it punched its horn up under the man’s ribs and exploded his heart within his chest. 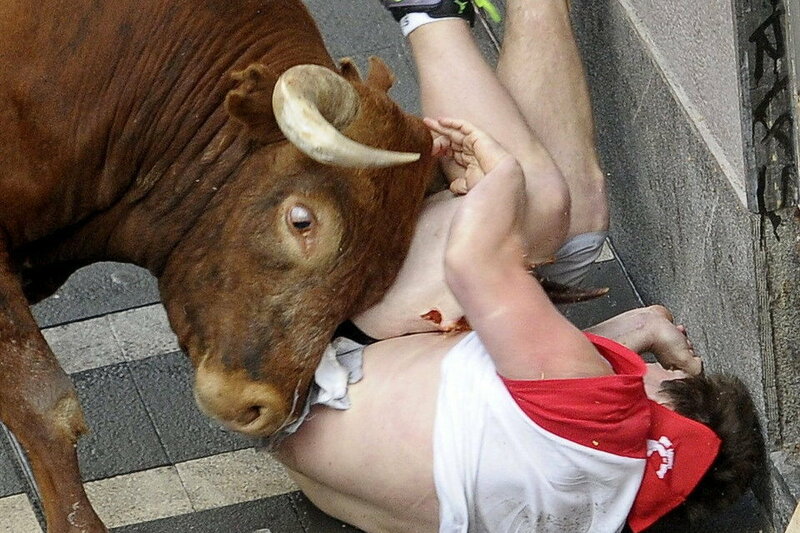 In total, fifteen people died in bull-running events across Spain in that year. In an encierro the streets themselves become a plaza de toros, a ‘bull ring’. In fact, in days gone by the bull-run and the bullfight were almost indistinguishable. The encierro often ended in the town square, which was then closed off with wagons or other makeshift barricades, and a capea, or informal bullfight would begin. In Pamplona, where the emergency services are primed and the medical expertise on offer that of a major city rather than a village or small town, there have only been fifteen deaths since records began in the 1920s. This is why, unless you know what you are doing, and especially what to do when things go wrong, you needlessly and massively increase your risk of leaving on a stretcher if you are lucky, and in a body-bag if you are not. The first recorded death was Esteban Domeño Laborra, from Sangüesa (where they also have an encierro), in 1924 – there is an account in The Sun Also Rises as Hemingway was there that year – while the most recent was Daniel Jimeno Romero, from Alcalá de Henares (where they also have an encierro), in 2009 –there is an account in Into The Arena as I was there that year. 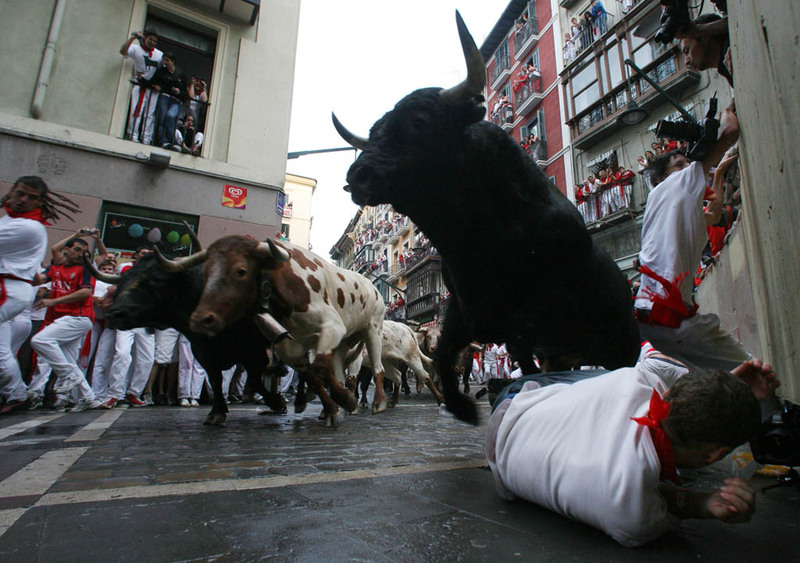 It’s worth pointing out these days, between fifteen hundred and three thousand people run in each of the eight daily encierros, and with only two fatalities this century, this means that the Pamplona fatality rate is around 1 in 150,000 runs. This is roughly the same fatality rate as jumping out of an aeroplane: according to the United States Parachute Association out of 3.5 million jumps in 2015, there were 21 fatal accidents. However, there is one great difference between skydiving and bull-running: before their first parachute jump, people are invariably taught by experienced professionals and usually their first jump is in tandem, where they are strapped to their instructor. In Pamplona, 99.95% of foreigners do the equivalent of renting a parachute from a store, buying a plane ticket and simply throwing themselves out of the door sometime after take-off. As if that wasn’t bad enough, they often do it drunk, while staring at their iPhone, and in some cases apparently without knowing the taurine laws of gravity. In 2013 this young man from Utah decided to run with his cell-phone in his hand, one can only assume to take a picture of the bulls rather than to actually watch them. He left the encierro without a spleen. In 2015, this young man from South Australia left without a good portion of his left leg: look closely and you can see the horn carving it like a Sunday roast. His main, cataclysmic error was running in the opposite direction to the encierro. Why would you try to run at a bull? Well, while the young man said in subsequent interviews that he was in no way intoxicated when he tried to escape past a lone bull this was not the story from those who visited him in hospital. If alcohol was indeed still oozing from his pores from the night before – an offensive odour to both man and beast – it would certainly explain why the bull hunted him around the corner of the street, even after he had limped out of its line of sight. It worked him over even further as he tried to climb out through the fence. Of the three golden rules in the encierro, though, the most important, the least instinctive and obvious, and the only one that is not actually illegal – there is a possible €1,500 fine for drunkenness and €750 for use of phones and cameras – is the rule about lying flat if you fall. If you go down, cover your head and stay down! Someone will tell you when to get up. This rule is the one most likely to save your life. The only American to die in the encierro of Pamplona, Matthew Peter Tassio in 1995, fell and then got up, putting all his major organs at horn height, hence the front-page photo in the local paper and chilling one word headline: Muerto, ‘Dead’. If he had stayed down, the bull would have passed him by: cattle have poor vision and are obsessed with not losing their footing, as you can witness when they leap high over the small three-inch-wide grate covering the gutter at the exit of the corral each morning. They will not tread on a fallen runner if they can possibly avoid it. Even if a bull is in a real killing mood, it is very hard for it to get its upwardly curved horns under a human being lying flat. This is why we still have our photographer Jim Hollander with us today after he did just this in 1977, as you can read in his chapter below. Last year alone saw 66 hospitalisations in Pamplona, including 12 major gorings and 1 minor, 2 bone breaks, 2 dislocated shoulders and 3 cranial traumas. However, those things are deep and dark unconscious causes, lurking in the Id along with the ghosts of dead bulls. The conscious reasons we runners keep returning are lighter, more positive things, although perhaps no less profound for it. Each author, myself included, tries to explain them in the chapters of this book, along with how to do it and better your odds of leaving on your own two unassisted feet, and with all the limbs and organs you came into town with. Although we have different perspectives on it, we authors are all agreed on one thing: the moments when one is running honestly and well, as part of the herd, respectful of both bulls and your fellow runners – which means not touching either – matching foot to hoof, aligning body with horn… these are moments of glory and beauty, oneness and surrender, such as you will never feel elsewhere in this life. Moments like the one when I ran the top of calle Estafeta between two bulls in 2011, the bull in front clearing a path through the impossible crowd, the bull behind chivvying me along. To run in the ‘aura’ of the bulls, to be close enough that you are a part of the ‘herd-space’, and to be accepted into it, is not the just the aim, but the dream of every serious runner, in both senses of the word dream. 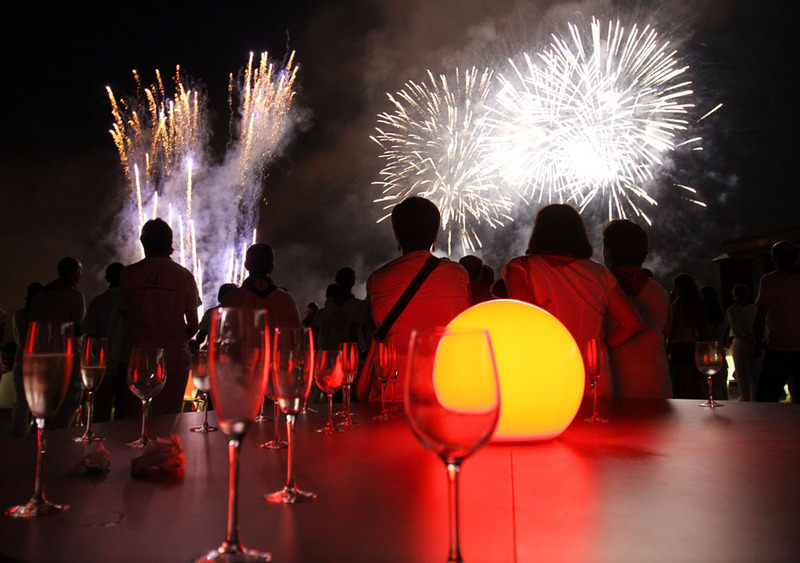 At noon of Sunday July 6th the festival exploded, there is no other way to describe it. It is worth saying that there is more to Pamplona than the running of the bulls. 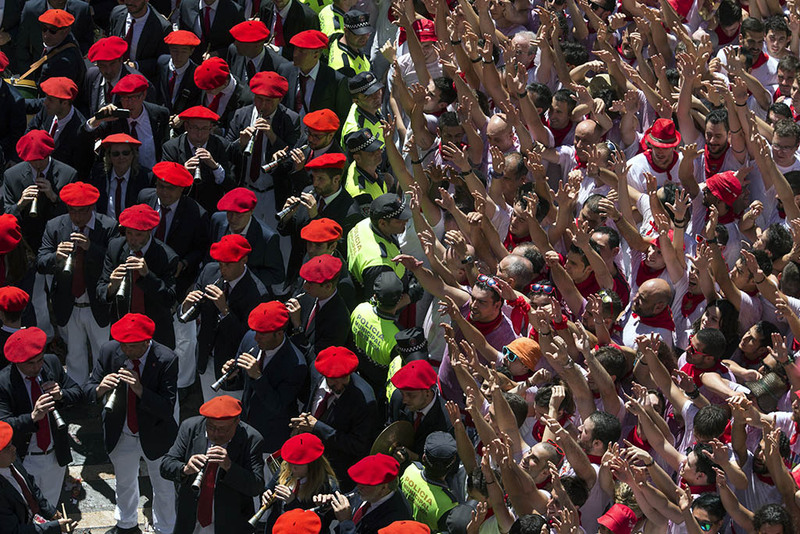 People don’t only come for the encierro and every July more than a million people do come – in 2016 it was 1.5 million – for the Fiesta of San Fermín, ‘Feast of Saint Fermin’, to a city whose standing population is fewer than 200,000 souls. However, while there are many great festivals in the world that pass the million mark – Carnival in Rio, Oktoberfest in Munich, Mardi Gras in New Orleans – only in one does each day begin with a stampeding herd of bulls charging down its main streets, accompanied by, or sometimes carrying impaled on their horns, the very brave, the very foolish, the very drunk and – along with them – the very few who know what they are doing because they do it again and again and again. Equally, there are thousands of ferias each year in Spain and the majority involve bulls, but there is only one Feria del Toro, ‘Fair of the Bull’, and that is in Pamplona. 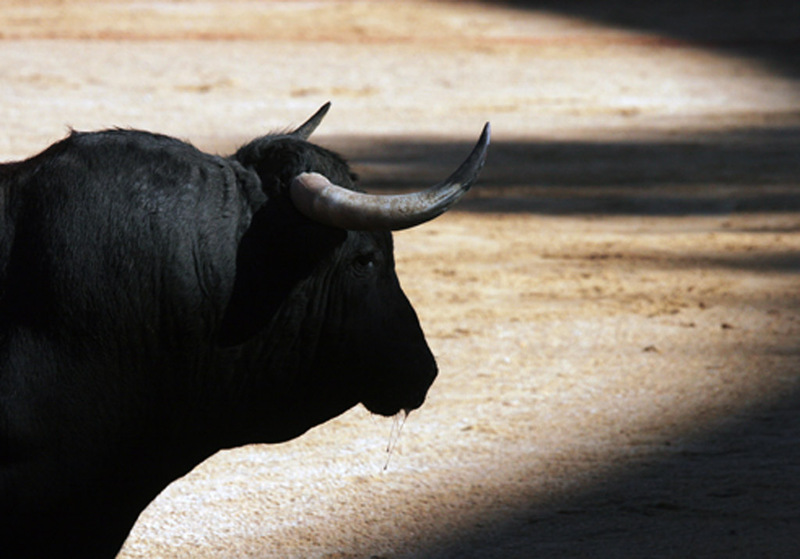 The largest, most famous and most dangerous bulls in the country are transported here from across the Iberian peninsula and, in an ancient tradition, every day from July 7th until July 14th, they are released from their corrals at 8a.m. to the sound of a rocket. Within a mere half mile from those corrals – usually run in under three minutes by the cattle, sometimes terrifyingly, agonisingly, longer, should they separate and become as dangerous as only a suelto, a ‘loose’ bull can be – this city defines itself. Which is why, with the blessing of the government of Spain, region of Navarre and city of Pamplona – and a foreword from the Mayor himself – I have brought these writers and runners together to create this book. John Hemingway has a name synonymous with Pamplona itself. Like his grandfather Ernest, he is a writer, most notably before this of Strange Tribe: A Family Memoir. Hemingway senior may have ‘discovered’ Pamplona for the English-speaking world ninety years ago, but John remains the only member of his family to have ever run with the bulls. Another famous American who was often seen in Pamplona was Orson Welles, a titan of cinema: producer, writer, director and star of films like Citizen Kane and The Third Man. His daughter Beatrice sent me her own childhood memories of the first time she accompanied her father here. 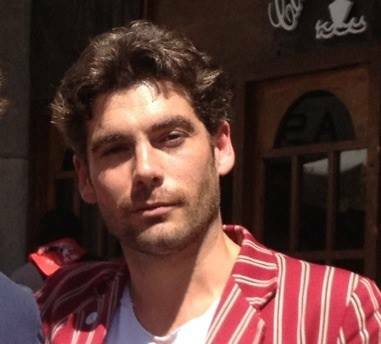 Joe Distler is from New York but now lives in Paris where he is a lecturer in English literature. He is also the most experienced foreign bull-runner of all time and the only person to have run every encierro in Pamplona (that’s eight each San Fermín) from 1968 to 2013 – that’s 368 runs in Pamplona alone – and after a brief retirement – the year of 2014 – he has been lured back onto the streets of Pamplona once again. Dennis Clancey was a captain in 101st Airborne Division, served in Iraq, and then came to Pamplona. 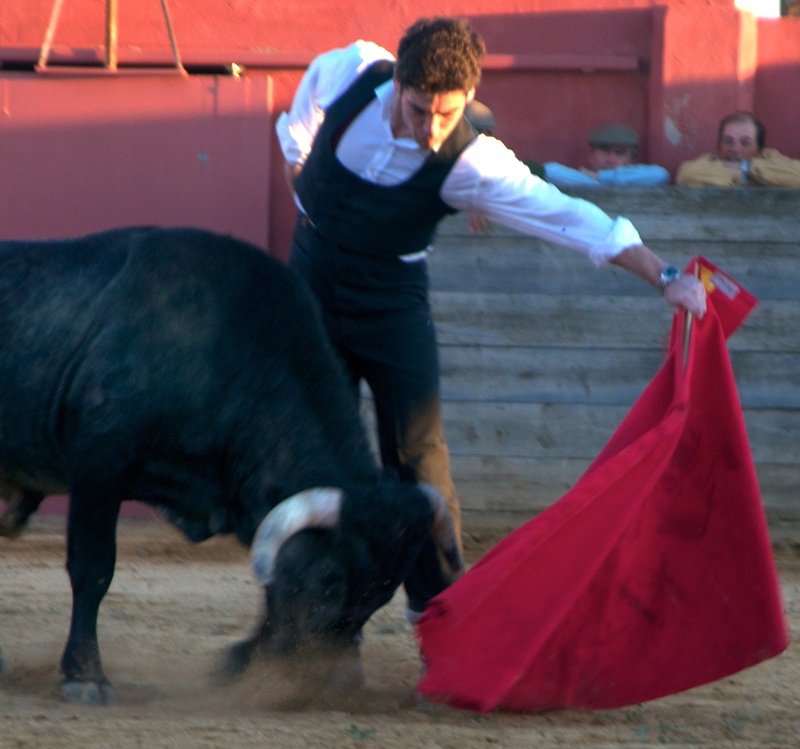 The word fearless is often used about filmmakers, but since Dennis took that up that profession it is justly applied: by his own account he started bull-running himself in case no one else could provide the sequences he wanted for his award-winning documentary on San Fermín, Chasing Red. There is no non-Spanish bull-runner to be found ‘running on the horns of the bulls’ more often that him on the streets today. Larry Belcher was a champion rodeo bull-rider from Texas, who fell in love with Spain – and a Spaniard, Dr Ana Cerón who so often stitches him up – and began running bulls in Pamplona in 1976. In 2016, after 40 years running, he switched to providing expert commentary on Spanish television, although he can still be found on the less crowded streets in Cuéllar, near his home town of Valladolid, where he was a professor of language and literature at the university. Jim Hollander came here to run before any of us foreigners in 1962, although he gave up running after the bloody events of 1977 which saw him injured and two others killed. He has photographed every encierro since, taking time off from his day job as senior photographer for the European Press Agency covering everything from warzones in the Middle East to the Olympics in London. We owe a great debt to EPA for allowing us to republish so many of Jim’s world famous and multiple award-winning back catalogue of photos. 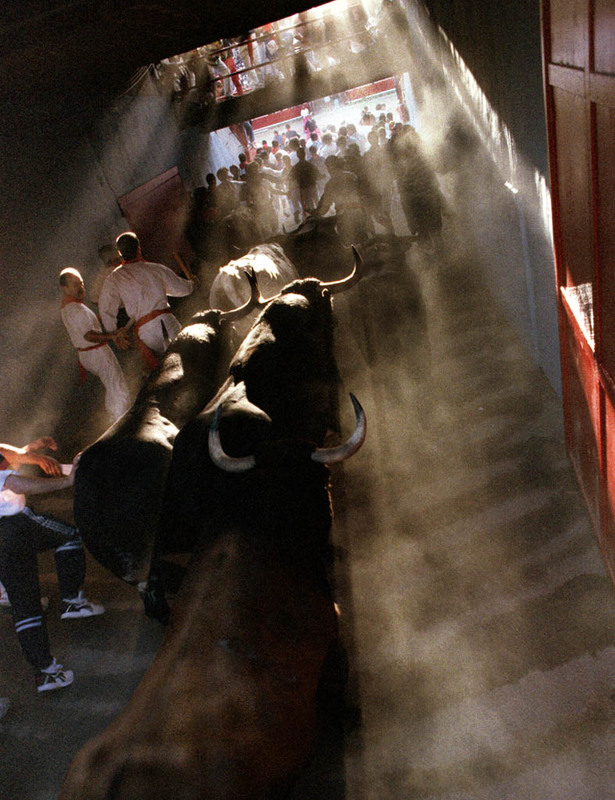 Jim also authored the photographic book Run To The Sun: Pamplona’s Fiesta de San Fermín. The most important thing to remember about Pamplona in particular, and los toros in general, is that we are all just tourists in someone else’s world. Which is why I have included words not only from the mayor of the city, but also translated words of advice from four of the best known bull-runners in Spain, with well over ten thousand encierros of experience between them. None of the writing I have ever read on the subject in English has asked these men what they think, or represented their views and their hard – indeed bloodily – earned wisdom. So, we foreign runners are complimented by advice from our Spanish and Basque friends: the late (as of last summer), great Julen Madina from San Sebastián, Miguel Ángel Eguiluz from Pamplona, Jokin Zuasti and Josechu Lopez from Cuéllar. Just as the pictures of Jim Hollander are complimented by some from Nicolás Haro from Seville, winner of PhotoEspaña 2013, and whose family bred the bulls of Marqués de Malpica until the old Marqués, his grandfather, sold the herd. My own final introductory words of advice are simple: if you want to guarantee you’ll survive running the bulls, stay off the street and watch it from a balcony. There’s a great deal more to Spain’s ultimate Fiesta than defying your own fear of death, or proving you don’t have one to everyone else. Come to Pamplona, raise a glass, step a dance, meet a person you’ll love for ever, lose one who didn’t love you, but whatever you do, don’t take the moments after the rocket goes off at 8 a.m. any less seriously than you would your own funeral. The Bulls Of Pamplona Blog at WordPress.com.